Make it a great weekend with these Maple-Bacon Waffles. These tangy-buttermilk waffles full of sweet and savory bacon will have the whole family up and out of bed. Ever since I bought my new waffle maker a couple of months ago, we have been trying all kinds of waffle recipes. 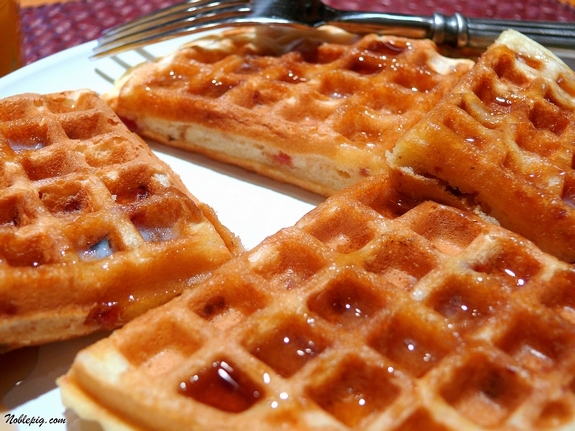 This particular recipe makes a nice sturdy waffle and is great for breakfast, lunch or dinner. It’s far superior to an store-bought mix. What I liked was being able to make my own maple flavored bacon and using either precooked or uncooked bacon to start. I also appreciated that this recipe was not too sweet. I enjoy syrup, so when the waffle is too sweet, it’s just overkill. This is great for those weekends when you are craving just a little something more special than just toast and coffee. However, it’s also perfect for a weeknight meal. Preheat oven to 375 degrees; line a rimmed baking sheet with parchment paper. Lay bacon on sheet and brush both sides with 2 Tablespoons maple syrup. 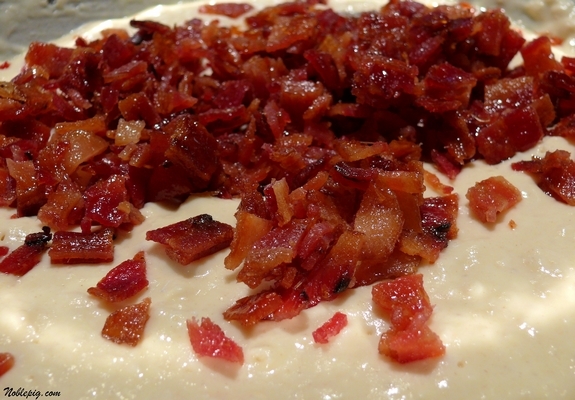 Bake turning once until crisp and browned, 20 to 25 minutes for uncooked bacon or 8 minutes for precooked bacon. Discard fat and lower oven temperature to 200 degrees . Coarsely chop bacon. 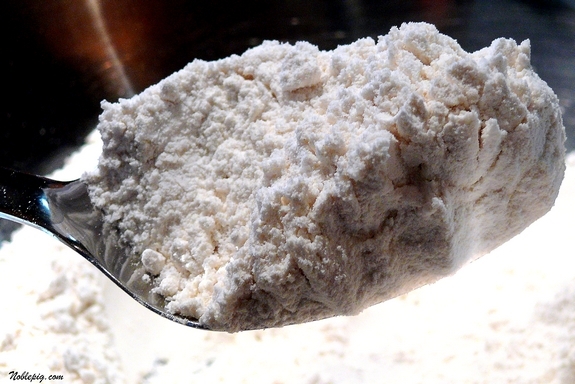 In a large bowl, mix flour, baking powder, baking soda and salt. 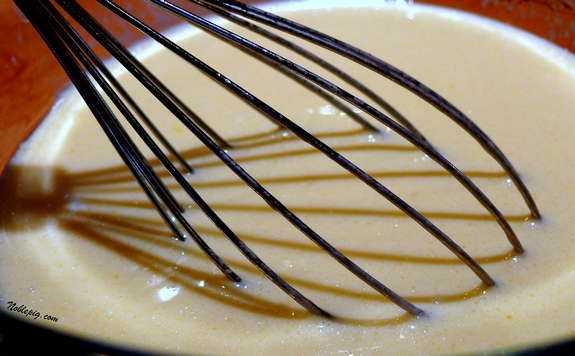 In another bowl, whisk buttermilk with canola oil, eggs, and remaining 4 Tablespoons maple syrup. Stir buttermilk mixture into flour mixture. Fold in bacon. Preheat your waffle maker and brush with a bit of oil. The waffle batter is very thick so I filled up a 1 cup measuring vessel with batter and poured most (maybe 3/4 cup) of batter onto the iron, spreading it around. This amount will vary depending on the size of your waffle iron. Cook until lightly browned and crisp, about 4 to 5 minutes. Place waffle on a plate in the oven; cook remaining waffles. Serve with butter and syrup. In a large bowl, mix flour, baking powder, baking soda and salt. In another bowl, whisk buttermilk with canola oil, eggs, and remaining 4 Tablespoons maple syrup. Stir buttermilk mixture into flour mixture. Fold in bacon. One Year Ago: Are You Against It? Mmm! I love bacon in my waffles! 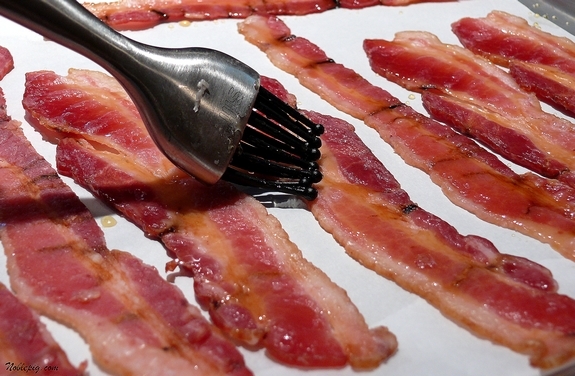 Great idea brushing the bacon with maple syrup. I must try this! It is cold here. Like, 15 below zero cold. These waffles would warm me right up! I love BACON!! Holy Cow those look awesome, better than my bowl of Cheerios. All-in-one breakfast waffles, so to speak. It doesn’t get much better than that. Yummy, Cathy! This is what Id call bliss on a plate! Thats how good it looks. I need a waffle maker. This is a 2 for one type of breakfast.Delicious! Mere words cannot express what I feel about this recipe. Maple. Bacon. Yes. So I love bacon and syrup and waffles and I have not eaten breakfast as of yet. I love this post!! Bacon and maple syrup…a perfect combination. I don’t see why not. Just spread the batter around since it’s thick. Making for dinner. Thank you. While a fan of both waffles and bacon . . . having them in one entity is something I have never tried. I LOVE waffles. Unfortunately, the boys would rather have some bacon on the side of their waffles. I still should try it sometime! such a classic comforting American breakfast. I normally miss having this when I am on vacation in Bali, because it is so hard to find bacon there. Looks scrumptious Cathy! Sweet merciful crap, those look awesome. I have to make them for my girlfriend, she’ll be ecstatic. Yum! I can even see having one plain as an on the go breakfast! Now that’s my kind of breakfast – I WILL be making these soon. Bookmarked. I haven’t used my waffle iron in awhile, so I might have to make these for my son. Oh ya – this looks totally and completely edible. This moderation diet’s killing me – limited carbs. Boo. This is going on my first carb load list right now. Course I’ll have to call in the big guy’s birthday rain check to get the waffle iron. Now that’s female logic! Those are some might fine lookin waffles there! Sheer heaven on a plate! And I’m not kidding. Bacon and waffles? Sweet wounded wuffles, what time is breakfast? Bacon and maple! love love love! I have to try this! This is a nice change from our usual pecan waffles! Thanks. Enjoy your waffle iron. Ours is a Belgian waffle iron, and makes perfect waffles. These look great. I don’t know anyone who doesn’t love bacon! I always keep waffle batter in my fridge, so anyone can just grab one any time. Okay I made these for dinner and loved how thick the waffle was and the chewy bacon along with the contrasting sweet/savory taste! Yum. This would go well with fried chicken a la chicken & waffles. Just saying! Now this is what I call a true test of will power. I’m afraid I’d lose. Just what I needed this morning. I wish I hadn’t had that peanut butter toast already! Bummer! Y’know what I really love to make with my waffle iron? French toast! Just soak the bread like normal, and instead of sauteeing/frying it…brown it in the waffle iron. YUMMMMMMY! This is bookmarked to make on a weekend soon! Love the maple flavor & the bacon here! Sounds wonderful except that I don’t have a waffle iron. I do, however, have a Williams Sonoma gift card. I’m thinking…. Oh, man, once I’m through my New Year’s Resolutions . 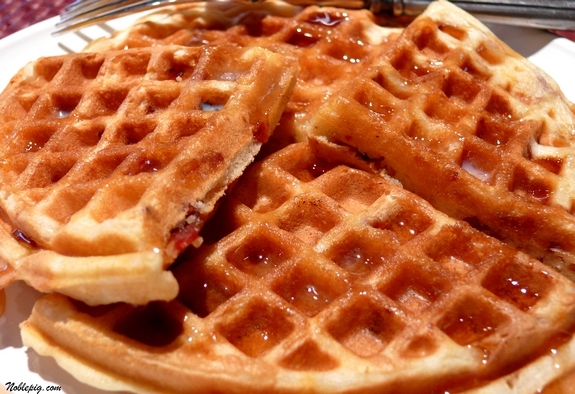 . .
One of my most favorite memories from childhood was bacon in our waffles…my Mom ALWAYS did this…loved it! Thanks for the memory…. We just got a waffle maker for Christmas. I think I will have to try these out, they look delicious. I have a waffle maker!! I am totally making these over the weekend! They look delish! 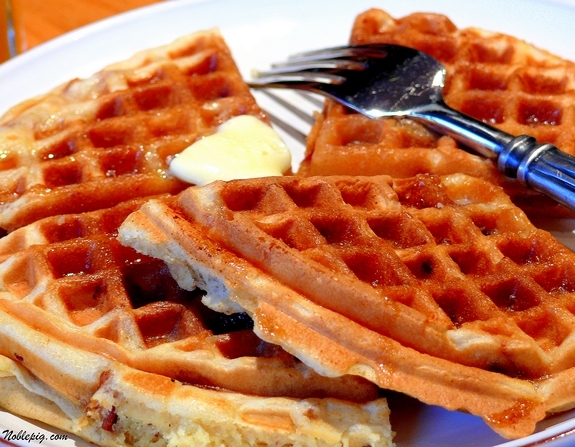 I don’t pull out my waffle maker very often, but maybe next weekend I will give this a try! OMG! I just saw this and told Mr. Snoots about it & I thought he might faint. I guess that’s what we’ll be having this weekend. These were fabulous, they made for a wonderful treat on Christmas morning. Easy and delicious. I have been eating bacon waffles for at least the last 55 years :). Only thing, my mother puts the raw bacon across the waffles (2 pieces across a four waffle iron) and the flavor of the bacon cooks into the waffle and is wonderful and the bacon actually gets crisp. Very good. I like a stronger maple flavor, so I added a little maple flavor to the batter—real none of that imitation maple, it tastes fake.